I have recently discovered that modern fake stamps of this issue are being flooded onto the market. I can tell you that real dangerous	fakes or some call forgeries have and are being flooded on the market as I write this page in November of 2015. My research into the printer has enabled me to discover modern fake stamps have been created in 2014!! They are being spread across the world through online auction sites like ebay and Delcampe. Everything about them is fake except for one dangerous fact, they have the correct perf size. The gum type is different for this issue in that it is yellowish in color. Very closely resembling the original gum if you do not have an original to compare with. I theorize that this issue was forged at an earlier date than the many forgeries I have written about in the past few months. I theorize they were "held" until just recently when they were released with many other forgeries. Most of the new forgeries have gum that is white in color and very shiny. This gum type was not used until much later years, long after Format went bankrupt thus proving they were not produced by the Format International Security Printers. Obvious differences will be shown below. So far I have discovered forgeries of the souvenir sheet as imperforates. They are being offered online right now as I write this on November 14, 2015. I have found documentation that 3,000 were released on the market back in April of 2015. I have not found if the stamp issue or the perforated version of the souvenir sheet have also been forged but suspect they have. 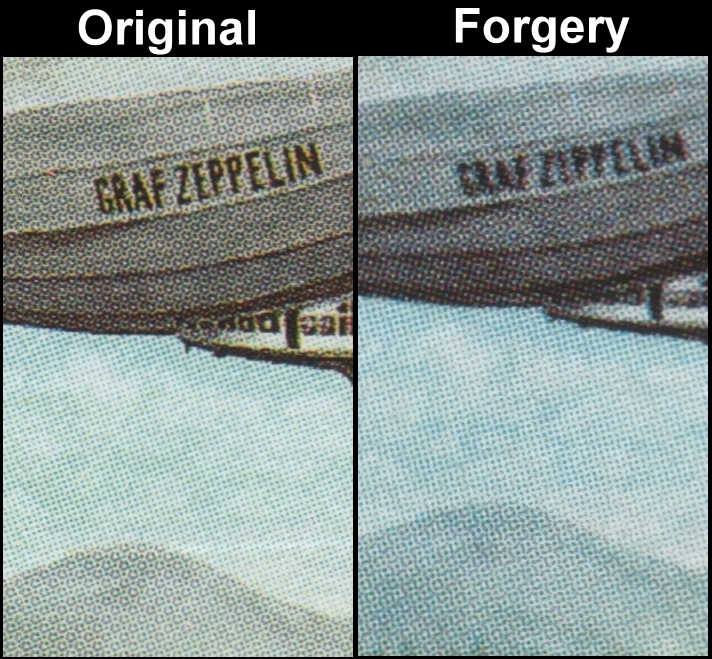 This souvenir sheet is very popular for zeppelin collectors and many other types of collectors. 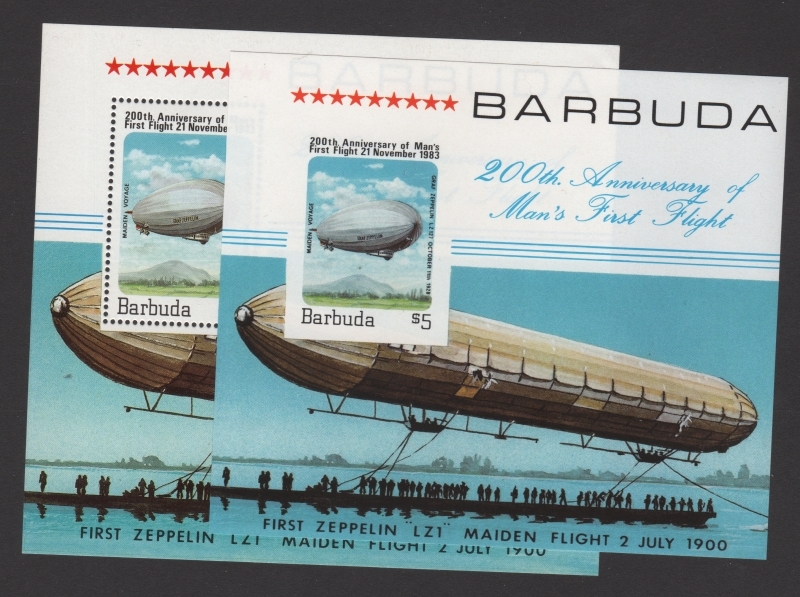 Months ago I noticed sales of the Barbuda 1983 Graffic Zeppelin souvenir sheet being sold as imperforates on ebay from users asrm10 and armi777 located in Latvia in lots of five or ten sheets starting bidding at 99c! I noticed just from the image that something was wrong but could not put my finger on it. 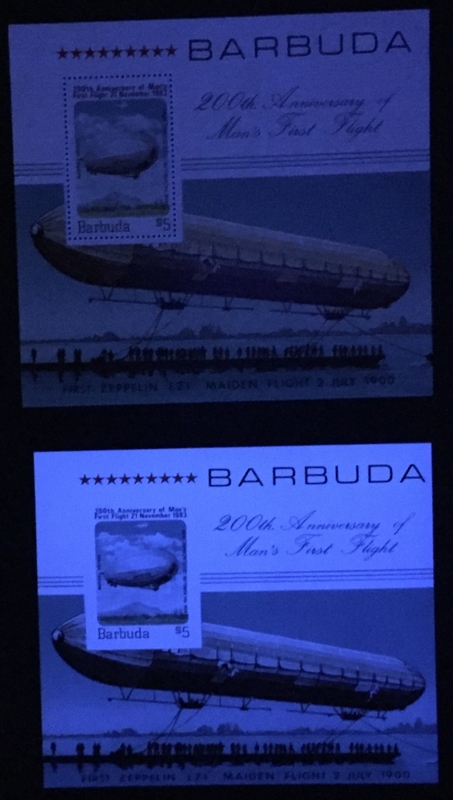 Recently through tracing I found the Gaertner major lot sold to the Latvian dealer and in the list of issues was the Barbuda 1983 Bicentenary of Manned Flight souvenir sheets! Back to ebay I go and won one of the lots from armi777 containing 10 souvenir sheets. I then chose a dealer who was selling the perforated version and purchased it. I just got it and immediately	compared it with the imperforates I just received and sure enough the imperforates are from a completely different printing than the originals! The colors, screens, fonts and gum completely differ. I found immediately that the forgeries are smaller than the originals! Here is an image to show it. This gum appears to still be PVA but with a flat appearance compared to original Format gum. The forged souvenir sheets are "curling" much worse than the original one I received which has a natural "bending" from age and the type of gum Format used. Again there is an obvious difference in color and texture. 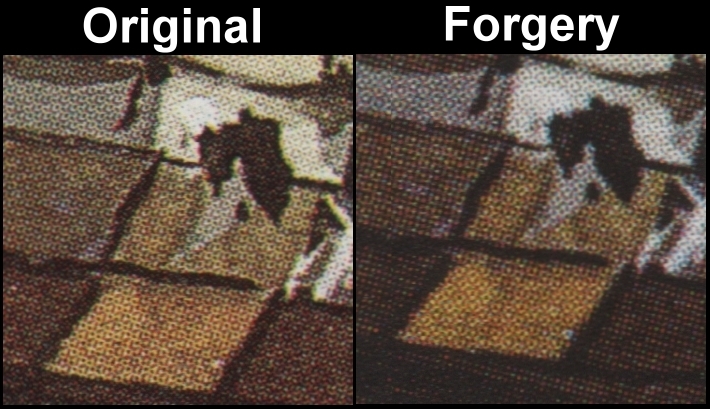 Note how can see through the forgery much more than the original. First let us look at the stamps on the souvenir sheets. This one compare's the zeppelin. 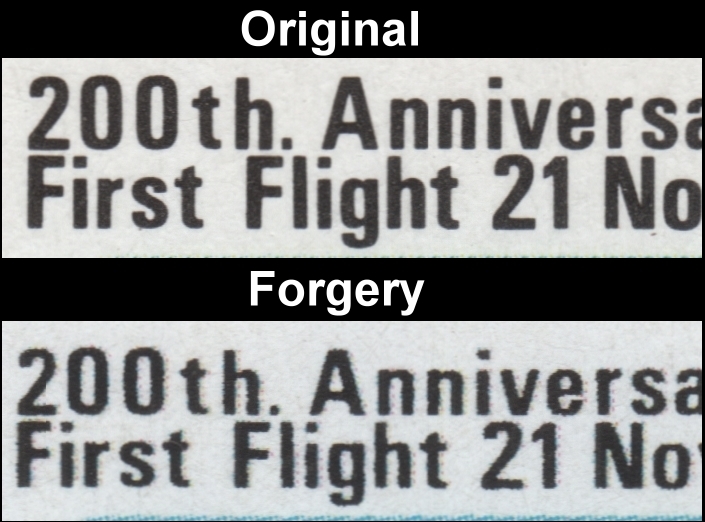 Note the extreme difference in color on the fake stamp. The loss of much of the details. The inferior screen pattern. 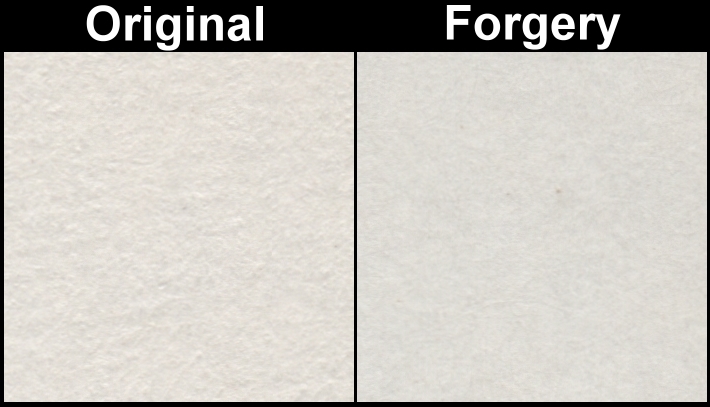 Most of all note that the image is smaller on the forgery. Now here is a section of the side of the zeppelin on the souvenir sheets. Now here is a comparison of the left star in the row of stars. 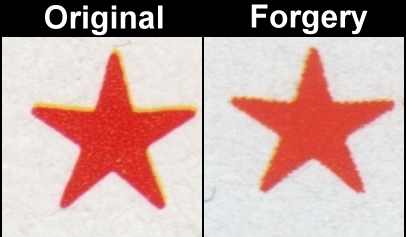 You can see that the original has a larger star and that it is more red. Here you can see the original has larger and bolder fonts. Note the difference of the paper as well. Now that you know what to look for you can see a stunning difference yes? 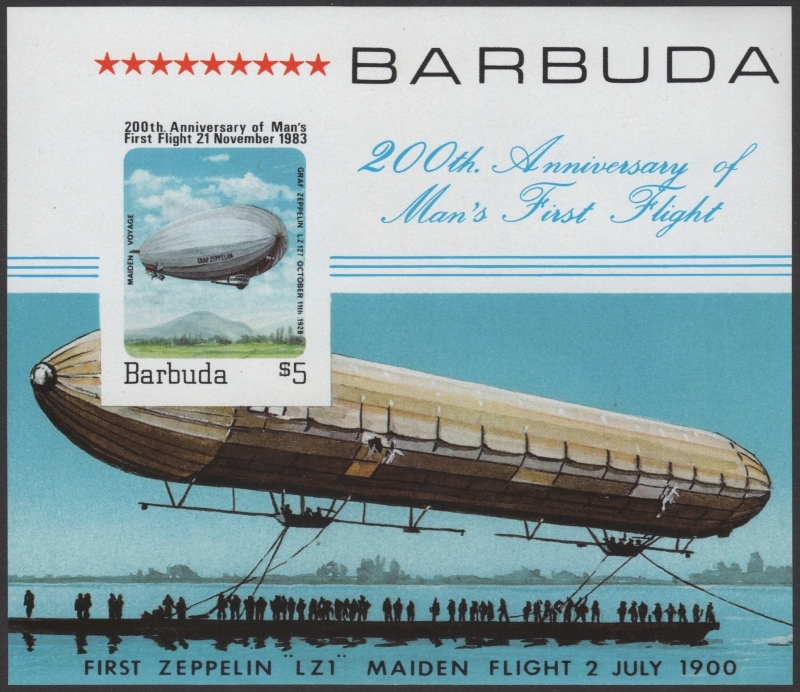 You can now define the fake Barbuda 1983 Bicentenary of Manned Flight Graffic Zeppelin souvenir sheet easily and can now possibly avoid being ripped off! Sadly, many have been ripped off already!